Earlier this school year, I donated four hours of labor to a fundraising auction. A fellow teacher got the high bid and wanted me to build some shelves for her mother. Tonight I made good on my promise and built these shelves in their newly constructed garage. 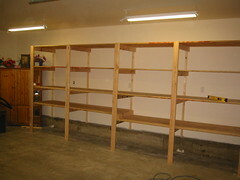 They are 3/4 inch plywood shelves; sixteen feet long, eight feet high, and 30 inches deep. She will be able to fit a lot of stuff on those shelves! I had to be a little careful working in the garage with a fully restored 57 Tbird next to me! Looks great. I thought it was your garage at first though. When is that going to happen?